New Year’s Eve calls for something special, but if you’d rather skip the crowded, overpriced restaurant scene that night, you can easily make a restaurant-quality steak at home by adding one simple step. A thick-cut NY strip steak is worthy of any special occasion, but even a perfectly grilled steak can be improved by basting it with a simple, delicious garlic-herb butter. 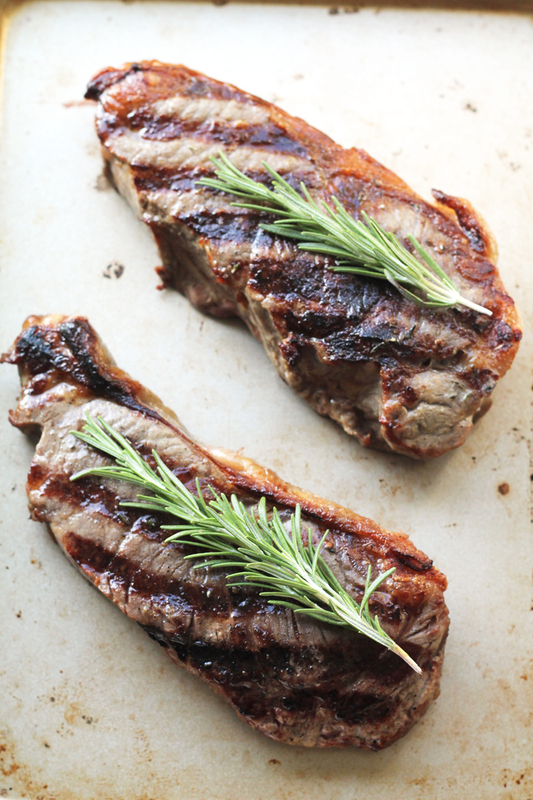 Simply melt together a little butter with fresh garlic and rosemary to brush on the steaks while they cook. It’s really that easy. I like to use steaks that are about 1” thick to help make sure they don’t overcook and dry out on the grill. Season them generously with salt and pepper before putting them on the grill and then baste them occasionally with the garlic-rosemary butter while they cook. This simple, flavored butter takes an already delicious cut of meat and makes it worthy of any special occasion. 1. Remove steaks from refrigerator 15-20 minutes before grilling and allow them to come to room temperature. 2. Place butter, garlic and rosemary in a small saucepan over medium-low heat until butter is melted, stirring occasionally. Remove from heat and set aside until ready to use. 3. Prepare the grill for direct high heat (450-500F) and allow to preheat for 10-15 minutes before brushing the cooking grates clean. 4. Place the steaks on the grill over direct heat and close the lid. 5. Grill for 3-4 minutes before opening the lid and flipping the steak. Brush the top of the steak (the cooked part) generously with the garlic butter. 6. Close the lid and let the steak cook another 3-4 or until the internal temperature reaches your desired temperature. 7. Remove the steaks from the grill, brush both sides with more butter, and tent loosely with foil. Top wtih a sprig of fresh rosemary. Let the steaks rest 5-10 minutes before serving. Get more holiday inspiration here! Share your grilling memories with us!